Michele was chosen by our Student Success Team because, despite having an unsure start, she persevered. With the help of her Success Manager, she moved to become one of the top achievers on the UCT User Experience Design online short course. On this online UX design course, Michele explored ways in which she could deliver more creative solutions to improve the user experience design her customers were met with. Why did you decide to take this UX design coure? After starting my own business 10 months prior to starting the course, I saw the quiet November and December months as the perfect opportunity to upskill and learn new things. Business people spoke about technical terms I didn’t understand, and that just made me want to learn more. I had work experience from working in advertising years ago but needed technical training. What were your concerns before enrolling on this online ux design course? How were your concerns alleviated and why? I had never studied online before. I was quite unfamiliar with the process and because of this, I lacked the confidence to engage in conversations on the student forums. Talking to Lisa and the Support Staff, I was guided through the process and quickly felt confident enough to contribute to the online conversation. 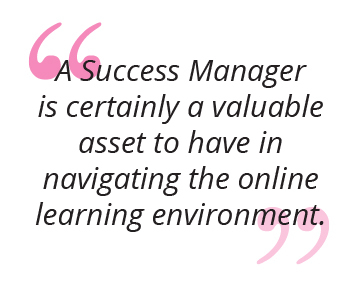 A Success Manager is certainly a valuable asset to have in the online learning environment. I enjoyed the way the course material was presented. The different mediums and methods they made use of like video, notes and online sourcing, as well as reading current and affiliated sites. The Student Forum, which still remains an activity I’m not too comfortable with. I have my own advertising agency – EMPIRICAL Design – and as the Creative Director I certainly have a better understanding and a more in-depth knowledge of what UX designers do and how to recruit them. I can also now confidently offer a great new skillset to my clients. It certainly adds credibility to my 35 years of experience. I’m offering this to current and new clients as part of the packages I sell. I’ve also added this to my CV. Time management, diligence and reading the course content numerous times, writing, and reading again to imprint new patterns of thinking.